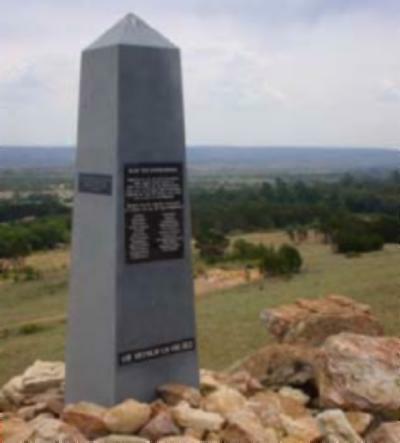 Diamond Hill, an action fought on 11-12 June 1900, during the Second South African War, between British forces under the direct command of Field Marshal Lord Roberts and the main Boer army of the Transvaal republic under General Louis Botha. 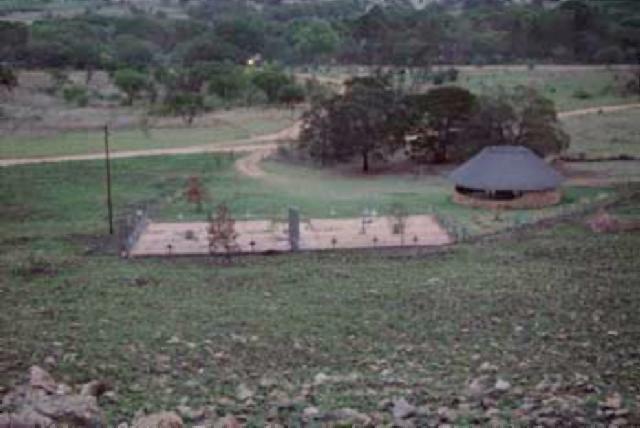 Diamond Hill, an action fought on 11 - 12 June 1900, during the Second South African War, between British forces under the direct command of Field Marshal Lord Roberts and the main Boer army of the Transvaal republic under General Louis Botha. The latter, comprising 6.000 men and 23 guns was menacing the Transvaal capital, Pretoria, which the British had entered with 25,000 men on 5 June, by occupying a 50-kilometre front east of the town. To deal with this threat Roberts moved out on 11 June with 14,000 men and 70 guns - all he could spare from the protection of his lines of communication. His plan called for attacks by Lieut.-General John French's cavalry and mounted infantry in the north and Lieut.-General Sir Ian Hamilton's infantry and mounted infantry in the south, which were intended to tie up both enemy flanks before a main attack was attempted against the centre. Botha had accurately anticipated Roberts' tactics, and was ready to deal with both flanking movements. French's force comprised only 1,400 horsemen (including ten members of the 1st Australian Horse and 35 of the New South Wales Lancers) and, although supported by a dozen field guns, was easily stopped by General J.H. De la Rey and forced to remain in defensive positions for the night. In the opening moments on this flank, a troop of the New South Wales Lancers which was sent forward on scouting duty was mistaken for Boers and shelled by the British guns, fortunately without any of the Australians being hit. Not so lucky was the New South Wales Ambulance, which was later struck by an enemy shell and damaged while moving about in the front-line. 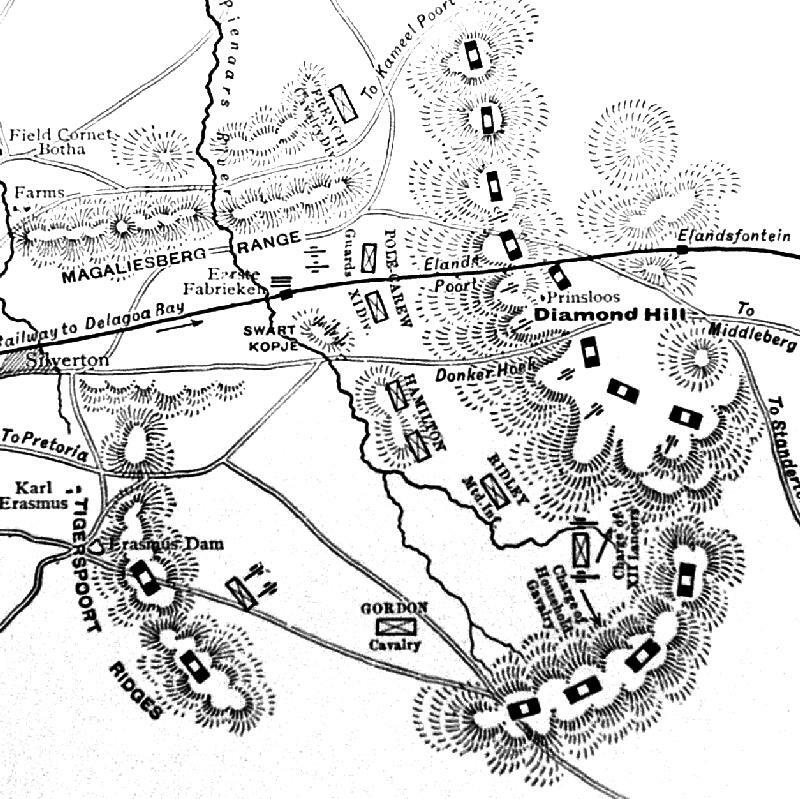 On the right flank, meanwhile, Hamilton found himself strongly opposed by Boers under General Piet Fourie who occupied a long rocky ridge line dominated by Diamond Hill. In attempting to press ahead in the face of fierce resistance, part of the British force was almost surrounded when night ended the first day's operations. In the face of the situation which now confronted him, Roberts was reluctantly forced to contemplate a costly frontal attack in the centre against enemy positions which had been barely touched. Reports during the night, however, persuaded him to lend his support for a main thrust to be mounted by Hamilton against the Boer strong point at Diamond Hill. The assault which was finally launched shortly after noon the next day entailed five battalions moving against the western slopes leading onto the Diamond Hill plateau. Although successful, the effort soon became bogged down when the Boers retreated to covering positions and the attackers were exposed to murderous fire from high ground on both flanks. This pressure was only relieved when the brigade under Colonel H. De Lisle, which contained a battalion of British mounted infantry along with both the New South Wales Mounted Rifles and West Australian Mounted Infantry, made an assault onto the Rhenosterfontein kopje on the British right. This position was effectively the eastern extension of the Diamond Hill ridge line, and the source of much of the fire which pinned down the main assault force. De Lisle, sent to concentrate his efforts against the Rhenosterfontein position during the morning, had used the two pom-pom guns with his force to cover the men of the 6th Mounted Infantry Battalion as they began steadily working their way forward on foot until they were close under the hill. By 2 p.m. De Lisle ordered the Mounted Infantry to advance. As soon as he saw that the leading troops had gained a foothold, he moved his pom-pours up to within 1,300 metres and in the words of The Times history of the war - 'let go the New South Wales Mounted Rifles'. 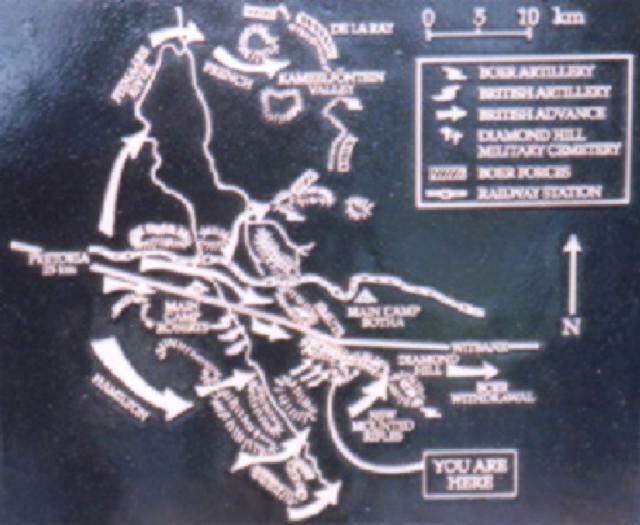 The Australian plaque commemorating the Battle of Diamond Hill. Extended in this way the 350 men of the corps created the appearance of a much larger force, and as they swarmed over the crest of the hill with fixed bayonets, the Boers without waiting for the attack retired to a second position some 1,200 yards away. With darkness now beginning to fall across the hill, the Boers opened up a 'furious fusillade' along the whole line of the position. Botha, however, upon hearing of De Lisle's success, realised that that part of the ridge line which his men still held would be untenable as soon as Hamilton brought up heavy artillery onto the plateau. He accordingly gave orders for his commandos to disperse during the night, the retirement commencing at 11 p.m, and being carried out so quietly that it went undetected until the next morning. Roberts was therefore initially unaware of the victory which his force had obtained, at a cost amounting to less than 200 casualties (including two officers killed and six men wounded among the New South Wales men engaged), Boer losses were probably heavier than the 24 killed and wounded that were admitted but were still minor nonetheless. 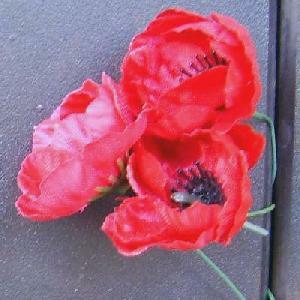 The only pursuit of the retreating enemy was carried out on 13 June by a detachment of 150 Australians, mainly men of the West Australian Mounted Rifles under Major Hatherly Moor with come members of "C" Squadron of the New South Wales Mounted Rifles. This force followed the Boers for nearly seventeen kilometres, to near Bronkhorst Spruit station, and fought a brief action with an enemy rearguard in a laager (camp). The role of the Australians during the action at Diamond Hill - the last great defensive battle fought by the Boers - was much praised, and during a review at Elands River on 14 June Knight's men were cheered by British troops for the gallantry they had displayed there. Battle of Diamond Hill War Memorial. Extracted from the book produced by Chris Coulthard-Clark, Where Australians Fought - The Encyclopaedia of Australia's Battles, Allen and Unwin, Sydney, 1998, p. 78-81. The Roll of Honour contains the names of all the Allied forces known to have served and lost their lives during the Battle of Diamond Hill, South Africa, 11 - 12 June 1900. The Times, 14 June 1900, p. 5. The account is transcribed below. Kroonstad, June 12, 10 50 p.m.
Pretoria, June 12. Pretoria and Johannesburg perfectly quiet, and several of the inhabitants have expressed their gratitude at the peace and order which prevail. After surrendering the city Botha retired to a place about 15 miles east, on the Middelburg road; he had a small force at first, but during the last few days the numbers increased, and his being so near the town kept up excitement in the country, prevented burghers from laying down their arms, and interfered with the collection of supplies. It therefore became necessary to attack them. This I did yesterday. He held a very strong position practically unassailable in front, which enabled him to place the main portion of his troops on his flanks, which he knew from former experience were his vulnerable parts. I sent French, with Porter's and Dickson's Cavalry Brigades and Hutton's Mounted Infantry round by our left; Ian Hamilton, with Broadwood and Gordon's Cavalry Brigade, Ridley's Mounted Infantry, and Bruce Hamilton's Infantry Brigade, round by our right. Both columns met with great opposition, but about 3 in the afternoon I saw two of Hamilton's Infantry Battalions advancing to what appeared to be the key of the enemy's defence on their left flank. This was almost gained before dark, and I ordered the force to bivouac on the ground they had won. Pole-Carew, with his division, occupied our centre. As I have explained, he could not attack, but he gradually advanced so as to support Ian Hamilton, and, when I left the field, was on the line held by the enemy's outposts in the morning. I hurried back to get news of Methuen's movements. On hearing that the Free Staters had taken advantage of our crossing the Vaal to interrupt our line of communication, I sent Kitchener with such troops as could then be spared to Ver with orders to push south and communicate with Methuen, who, I knew, had a very compact force in the vicinity of Heilbron. I also despatched special messenger to Methuen to push on with all speed to the main line of railway. These two officers met at Vredefort Road Station on the evening of the 10th. They marched yesterday to the Rhenoster River, where Methuen gained a complete victory over De Wet, took possession of his camp, and scattered his troops in all directions; he and Kitchener march to-day towards Kroonstad. Her Majesty's Government need have no apprehension as to the security of the Army in South Africa ; the enemy gained a slight success, which is unfortunate, but this will be remedied very shortly, and it will not take long to repair the damage done to the railway, as the diversions are all in existence. I am now able to hold the line between this and the Rhenoster in strength, and Methuen will arrange to guard onwards as he advances. Hunter should be at Potchefstroom to-day, and will thence move on Johannesburg. I have communicated with Buller, who will, no doubt, soon make the presence of his force in the field felt. The Times, 15 June 1900, p. 5. Pretoria, June 13, 9.55 a.m.
We were engaged all yesterday with Botha's army. The enemy fought with considerable determination, and held our cavalry on both flanks, but Ian Hamilton, assisted by the Guards Brigade of Pole-Carew's Division, pushing forward took the hill in his front, which caused the enemy to fall back on a second position eastward. This they are still holding, and it is slightly higher than the one we have captured. The great extent of country which has to be covered under modern couditions of warfare renders progress very slow. Details of casualties have not reached me, but I understand moderate in number. The only further casualties reported up to date are-wounded, 8th Hussars, Lieut. O'Brien, shoulder; R.A.M.C., Major Hathaway, abdomen; both severe. June 13, 11 a.m. - The enemy evacuated their strong position during the night, and have retired eastwards. Buller's force and mine afforded each other mutual' assistance, Our occupation of Pretoria caused numbers of the Boers to withdraw from Lungs Nek, and Buller's advance to Volksrust made them to feel that their rear world shortly be threatened.